Eyes up, Guardian. Time to give up the Ghost. First round's on us! We are back for another episodes, this time with a full Fireteam. Good thing this worked out, too, as we are both talking about Season of the Drifter alongside our favorite moments over these past two years. Yes, we have been at this for two years and on this anniversary, we have set a new milestone with EPISODE #50, not counting special shows and little bonuses we have released in these two years. Want to hear the show in the raw? Here’s the LIVE feed! 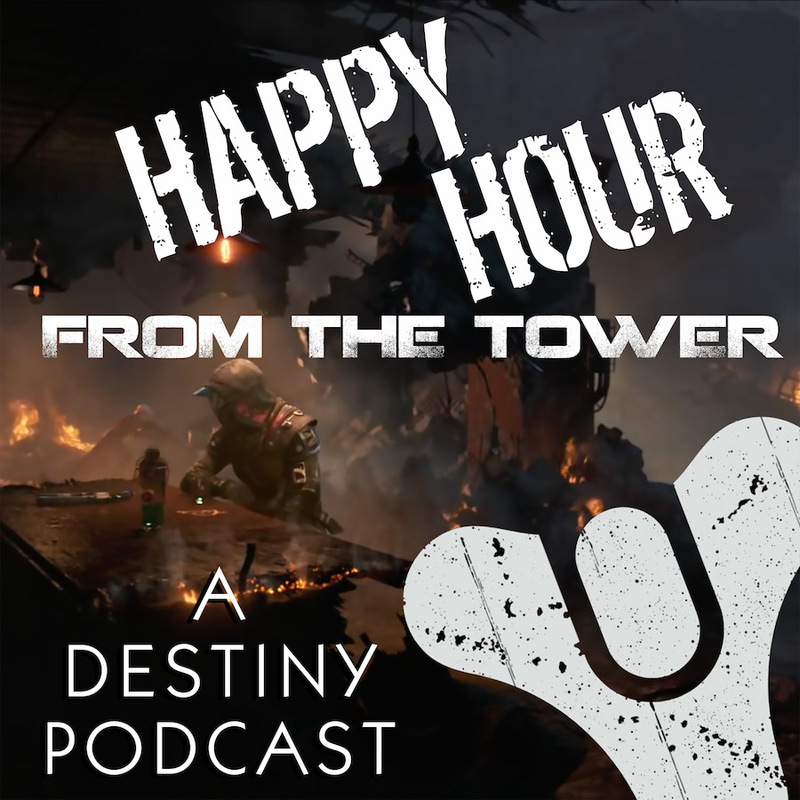 Interviews, videos, fan fiction, we have covered a lot of ground, almost as much ground as the Fireteam has covered in The Reckoning, something we plan to talk about in this fiftieth episode. Come on and join us for the fun, and share your favorite show memory with us at 703.791.1701 or podcast (at) happyhourfromthetower (dot) com. We’d love to hear from you! And hey — thanks for listening, Guardian! Did you know we are now recording LIVE ON TWITCH? Because yeah, we are. What do you know — the whole Fireteam is present! Obi is living good in the Carolinas. Brandon recovers from a field trip. Nick shares concern about the show bell. So, Brandon, what’s it like to be 15? Nick is rambling. Sort of. Saying “hello” to those folks in Chat! What’s going on with Destiny? What’s going on with us? Brandon joins the 700 Club and continues the Dredgen grind. Nick talks a bit about his Christmas lights, his status in Destiny, and his love for RNGesus. And this is when the slaphappiness begins. Assuring Nick that his quest for Wish-Ender is not the Whisper quest. Obi is 700 with two full sets of Gambit Prime gear — Sentry and Reaper. Tee is at 700 for the Warlock, 680 for my Titan. (We’re not talking about the Hunter.) Tee’s also got the Reaper set. Big shout-out to Jen Haring! Need help with the Reckoning? Obi and I are on call now! Is Tier III actually easier than Tier II in the Reckoning? Well, Tee and Brandon have opinions. The key word with the Reckoning: Timing. Now that we’ve been playing Season of the Drifter, what do we think about it? The Reckoning and Blind Well have a lot of similarities and differences. The Reckoning sometimes brings out the worst in Guardians, sadly. There’s plenty of other stuff to do in Destiny. Why is Nick so far behind in things? No, seriously, time does fly on this podcast. For Obi, it was Nick and Brandon’s first gift-giving. For Brandon, it’s all about the journey. That, and the inside jokes. For Tee, it’s been watching Brandon grow braver AND BOLDER on the show. For Nick, his stand-out moments include Joy Osmanski’s rejoiner and the SLAMANDA episode. Something about this podcast push us out of comfort zones. Let’s talk a bit about Steve Saylor and why we love running with him. And when did Tee decide to launch this podcast? During the writing of Podcasting for Dummies, the Third Edition. …but how much money are we giving up to the Bungie Store? Why did the guys suddenly go all Schwartzenagger? Watch the unedited video above! You all ordering ordering any of this stuff? Let us know! Will some of these Rewards be worth the wait? We will see. for the show at 703.791.1701, or here at the blog. And remember, you can find the show on iTunes, Stitcher, and Google Play! Subscribe, listen, and drop us a review. Time to give up the Ghost. In a Lawless Reef, a Guardian shall rise.